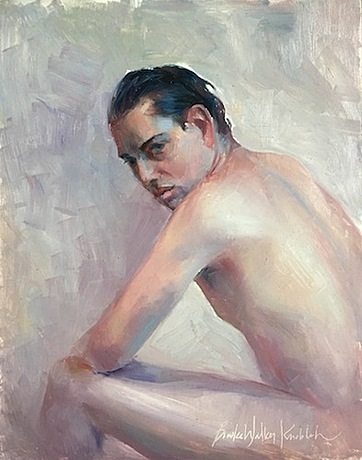 Slick, Oil , 14" x 11"
The human figure is endlessly inspiring for me. Capturing the dynamic movements, musculature, and character of our corporal bodies is as challenging as it is rewarding. My approach to expressing the human figure is both organic and gestural. By combining my knowledge of anatomy with the versatility of oil paint, I aim to express the essential nature and energy of a person with a brevity of stroke and spontaneous mark making.